Interested in studying abroad? Join us this Friday, November 6th, from 12:15 to 1:00 pm in the Adams Center Classroom (just inside the library) for a free catered luncheon. During lunch, honors students Alisha Sneed, Elena Kua, Kelsey Young, Anne Weaver, and Jenny Dodd will share some photos of their experiences abroad this past spring, and we’ll have more info on how to apply for an Honors College Travel Grant if you plan to study abroad in the future. 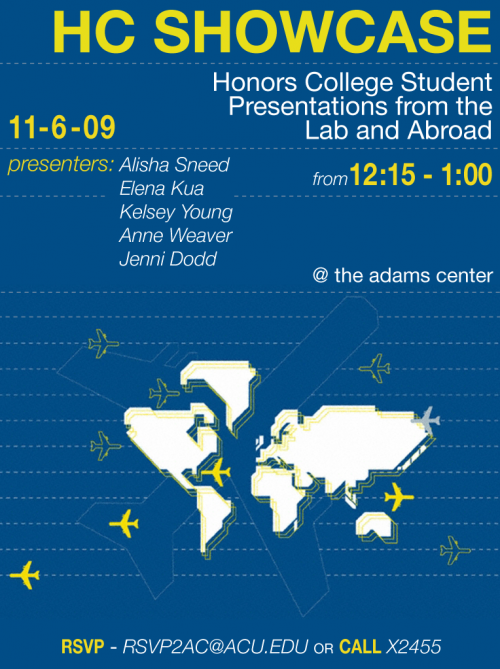 Any student interested in studying abroad with an HC Travel Grant is encouraged to attend! To RSVP, please call x2455 or email RSVP2AC@acu.edu by Thursday, Nov 5th!